Thousands of metastatic breast cancer patients nationwide have given researchers access to their tumors and DNA in the hopes it will lead to breakthrough treatments and therapies for one of the most deadly forms of cancer. As the groundbreaking study enters its second year, more than 2,900 women and men have signed on to participate in the Metastatic Breast Cancer Project (MBCproject) since it launched Oct. 20, 2015. Spearheaded by the Broad Institute of the Massachusetts Institute of Technology and Harvard, the project aims to find possible new treatments for the disease by examining patient-submitted DNA and medical records. Corrie Painter, the cancer researcher. Thirty-eight patients from Connecticut have expressed interest in the project and 21 of them have taken the next step and signed consent forms granting researchers access to their medical files and DNA as of November, according to Corrie Painter, the cancer researcher directing the MBCproject. Word of the project is spreading, in Connecticut and beyond, largely through word of mouth within the metastatic breast cancer community, she said. “It’s really phenomenal that we’ve had that type of response,” she said. The MBCproject is unique, she said, because it is patient-driven and gives researchers access to DNA samples they otherwise wouldn’t have. The online consent forms being used, she added, is allowing them to amass a much larger—and still growing—base of participants nationwide than other studies have had. Crowdsourced medical studies, where patients proactively provide information or samples on their own behalf, have gained popularity in recent years. They have been used to research various diseases, including ALS, or amyotrophic lateral sclerosis, and genetic disorders, according to a 2012 study published in the Journal of Medical Internet Research. Metastatic breast cancer, also known as stage IV or advanced breast cancer, is cancer that has spread beyond the breast to other organs such as the bones, lungs, liver or brain. Metastatic breast cancer cannot be cured, but it can be treated. Connecticut has the second highest incidence of new invasive breast cancer cases in women at 138 per 100,000, the U.S. Centers for Disease Control and Prevention reports. The national rate is 123 per 100,000. The state’s breast cancer mortality rate is 18.6 per 100,000 women, according to the CDC. The data is from 2013, the most recent year available. Study participants receive this kit in the mail. To enroll in the MBCproject, patients fill out an online survey at MBCproject.org. Project researchers then ask patients to complete an online consent form giving researchers permission to obtain copies of their medical records and some of their stored breast cancer tumor tissue. 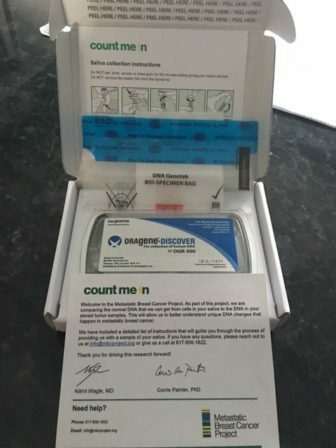 Those who fill out the consent also are mailed a kit to collect a saliva sample, providing additional DNA. For participants who agree, their work is done there. Researchers contact doctors and hospitals directly to obtain medical records and tumor samples. As the project recently crossed the one-year mark, researchers have sent out 1,300 saliva sample kits and received 900 back, Painter said. The saliva samples allow researchers to get patient’s “germline DNA,” or the normal DNA that occurs naturally in their body. Study leaders then can compare that to DNA mutations contained in tumor samples, gaining insights into how certain mutations spur cancer to grow and divide, Painter said. The goal is to learn as much as possible about metastatic breast cancer, with the hope of discovering new therapies and treatments. The MBCproject was started in late 2014 by the Broad Institute’s Dr. Nikhil Wagle, who still leads the effort. From the outset, researchers have worked with metastatic breast cancer patients, doctors and advocates to hone their techniques, including what questions are asked on patient surveys, Painter said. A slide of the tiny cells. 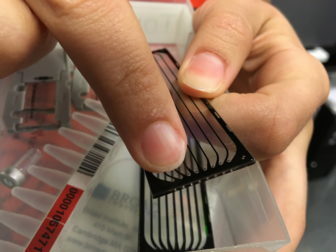 Throughout the process, participants are invited to the Broad Institute, a nonprofit academic research institution focused on understanding and treating diseases, to see how their DNA is being used. 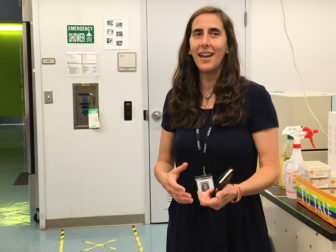 The researchers “make us feel like we’re part of what is going to help people,” said participant Jessica Leip, who shares her story in a video on the MBCproject’s YouTube channel. Now 40, she was diagnosed with metastatic breast cancer on her 37th birthday, with no family history or known risk factors. The MBCproject has no set end date, Painter said. “We’re going to continue to do this until we’ve learned all we can learn,” she said. For information on the MBCproject click here.